We’re not sure what’s got into The Lego Car Blog Elves this weekend, but they’re bringing back builds of a very classical nature. From the inventively old to the actually old now, and two absolutely beautiful Technic steam tractors from Flickr’s Nikolaus Lowe. An unusual choice for a Technic build we think these – somewhat oddly – qualify for ‘Technic Supercar’ status, being equipped with working steering, brakes, piston and valve gear, and a two-speed transmission. Head over to Flickr for the complete gallery of images, where you can also find a link to vote for Nikolaus’ design on LEGO Ideas, whilst we figure out how the Elves have been watching ‘Downton Abbey’. Huib van der Hart’s erection is so big it can’t be photographed. Thankfully he has managed to capture it in a more compact state, but even then it’s still absolutely massive. We’re talking about Huib’s unbelievable 1:16 scale Liebherr LTM 1750 mobile crane in BKV livery; all 18 wheels of it. Huib’s model is – as you can see here – astonishingly well detailed, but that’s only half the build. Underneath that amazing exterior is a full Power Functions remote control drivetrain, with six XL Motors providing drive, seven Servo motors steering all nine axles, and a third-party SBrick providing control via bluetooth. There are also working LED lights throughout plus – of course – this model can get much, much bigger. There’s a lot more to see of this incredible build at Huib’s Flickr photostream – click the link to make the jump, and ask him if he can try to get it up for a photo. Take that Audi Q7! We hate the Audi Q7, and the other pointlessly-enormous, overly-aggressive, status-symbols-on-wheels in the segment in which it occupies. We’ll happily take one of these though, as if you’re going to have a vehicle that’s impossible to park, won’t fit down a country lane, and drinks fuel, it may as well do all of those things to absolute excess! This is an articulated 8×8 off-road truck, loosely based on those by companies such as Foremost, and resembling some of the Soviet Union’s more impressively weird machinery. It’s been built by previous bloggee and Technic-building genius Nico71, and it’s an astonishing piece of engineering. 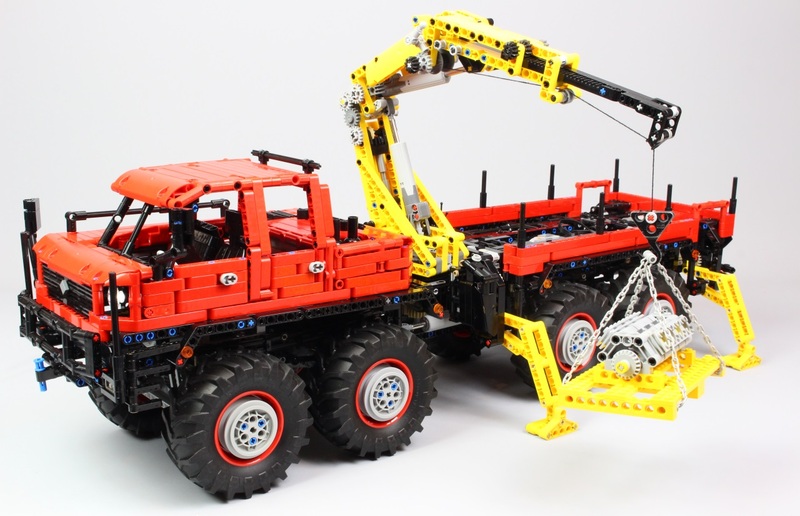 Using eight wheels and tyres from the brilliant LEGO Technic Claas Xerion 5000 set, Nico’s truck features all-wheel-drive, with one XL Motor driving the front two axles, and another the rear. None of the axles are steered as the entire truck articulates in the middle thanks to an L Motor and a pair of linear actuators. Each axle is suspended by an ingenious leaf-spring system, there’s an inline-6 engine next to the asymmetrical cab, and a set of four outriggers stabilise the truck for when it’s using the neat folding crane mounted over the articulation point. Powered by another two Power Functions motors this can extend, rotate and winch (see the image below), and like the drive and steering is operable remotely via bluetooth thanks to two third-party SBrick bluetooth bricks. There’s loads more to see of Nico’s ridiculously impressive build at his website, where full technical details and instructions (yes really, so please don’t message us!) are available, plus the complete gallery of images is available to view via Brickshelf. Nico has also become the sixteenth Master MOCer to be awarded such status here at The Lego Car Blog, joining an impressive roster of builders including Sariel, Crowkillers, Bricksonwheels and Firas Abu Jaber amongst others. Read Nico’s Lego-building story and and find out how he created his amazing Technic vehicles such as this one via the link to his Master MOCers interview below! 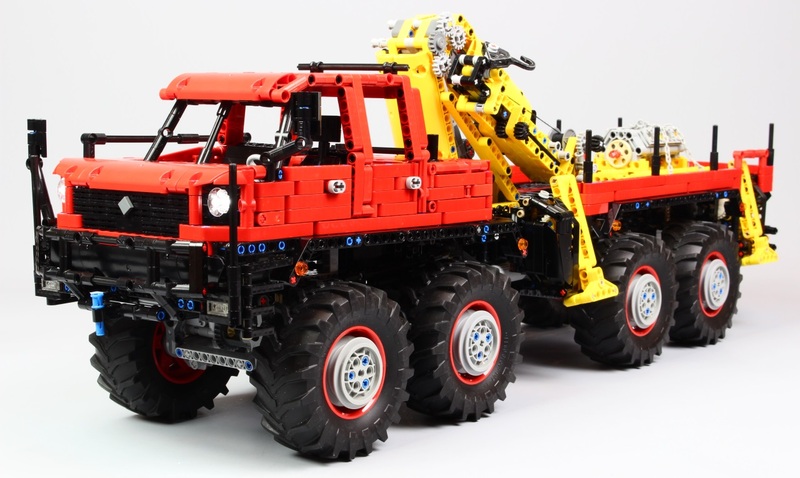 Yu Kee Liu, otherwise known as Shineyu, has become a firm favourite here at The Lego Car Blog for his beautifully engineered trucks and heavy machinery. Today we can share two of his latest, a Hong Kong style Scania R490 crane truck and a Volvo FH16 750. Both are developments of previous builds, with the Volvo first appearing here in 8×4 tractor-cab configuration, and the Scania in a 560 specification with a blue and yellow livery. Each model contains a raft of remote control features, including drive, steering, crane operation, LED lights, and more, all contained within exteriors that blend European truck design with Hong Kong functionality in astonishing detail. You can see the complete galleries for Shineyu’s incredible Scania 490 crane truck and Volvo FH16 750 models on Flickr. Head to Hong Kong via Europe at the links above. This is a fully operable, fully remote controlled replica of Grove GMK 6400 mobile crane, and it is spectacular. Built by ShineYu aka Yu Kee Liu it’s one of the largest, most detailed, and most authentically recreated vehicles that we have ever seen. Other than the 82mm tyres and some very neat decals, ShineYu’s Grove GMK is built entirely from our favourite Danish plastic, which makes it all the more impressive that it can drive (with multiple driven and steered axles) and that the GMK 6400’s truly enormous three-stage rotating boom is fully operable, powered by LEGO’s own Power Functions components. ShineYu has published an extensive gallery of images detailing his remote controlled Grove GMK 6400 to both Flickr and the Eurobricks forum, where you can see that incredible boom in its raised position. They’re the only links to a giant erection on the whole of the internet that are safe to click! Take a look and be amazed. It’s a tough life being a The Lego Car Blog Elf. You spend all day dodging dogs and seagulls in the hope of finding a Lego creation worth blogging so that you’ll get fed, and then whilst you’re asleep in the cage room one of your colleagues drives in a remote control tractor with a giant mechanical claw on the back, picks you up and dunks you in the toilet. Still, they bring it upon themselves. The vehicle responsible is this rather impressive fully remote controlled Technic John Deere 648L by Brickshelf’s pipasseyoyo, complete with twin L motor drive, articulated steering via two mini linear actuators, a remotely raising/lowering front mounted blade, raising, rotating and opening claw, and an inline-6 piston engine. It’s a lovely bit of kit and there’s more to see of pipasseyoyo’s build via Brickshelf, where there is also a link to a video of the model in action. Click the link above to take a look. It’s not size that matters but what you can do with it, and Eurobricks’ Paave can do a lot. 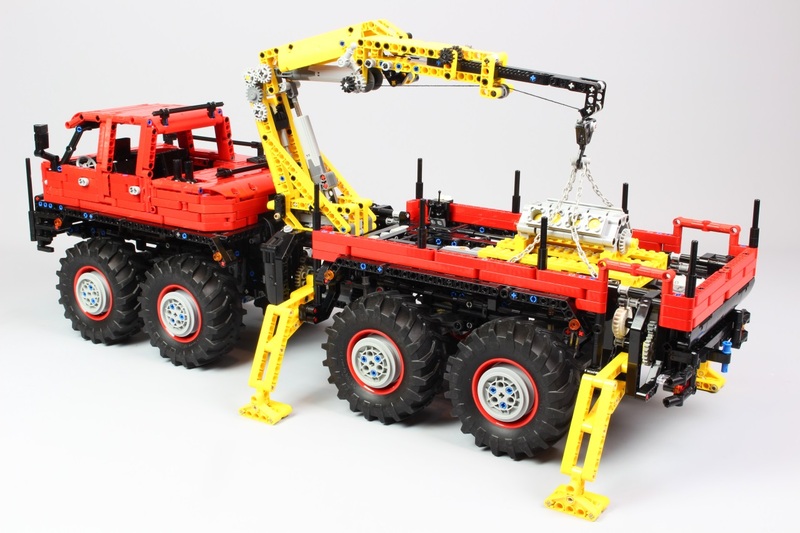 This diddy Technic mobile crane might be considerably smaller than pretty much any other Technic creation we’ve blogged, but it’s got more squeezed inside it than your Mom’s corset. The rotating superstructure, elevating and extending boom, hoist, steering and outriggers are all functional via hand-powered mechanics, and Paave has managed to ensure his model looks pretty good too. It’s just the sort of thing we’d like to see from an entry-level Technic set and there’s more to see on Eurobricks via the link above or via Brickshelf here. Even your Mom hasn’t seen one this big. This is a Liebherr LR 11000 crane, and it’s seven and half meters tall in its full configuration (or 2.5 metres when indoors so it fits!). Built in 1:24 scale, this brick-built behemoth weighs 27kg, including 5kg of lead ballast. Other than that lead weight, some string, and a few 3D-printed pulleys, the entire model is completely constructed from standard LEGO pieces. Which makes it even more astonishing that this enormous replica works. Dawid Szmandra is the engineering genius behind the build, and yes this 27kg Lego creation really does work. With four Mindstorms EV3 processors, nine motors, seven light sensors and a touch sensor, this incredible creation can do everything that the real Liebherr LR 11000 can do. Only at one twenty-fourth the scale. Which is still massive. The drive to the tracks comes from two EV3 Medium Motors, whilst another can rotate the entire superstructure. Five Large Motors plus another Medium power the six separate winches, whilst the sensors can measure the load and winching distance. 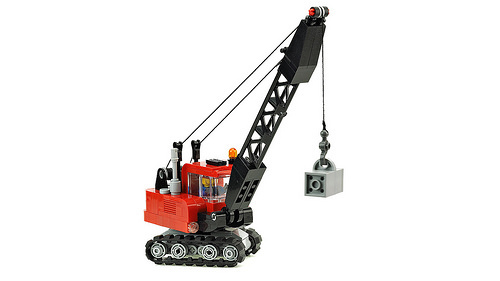 The result is a crane, built entirely from little plastic bricks remember, that can lift a chair. There’s only one way fully appreciate what this incredible creation can do and that’s to view it in action. Join us watching in amazement via the video below, and you can see all the images of Dawid’s unbelievable model at his Flickr photostream and via the Eurobricks discussion forum. We don’t often post railway-related builds here at The Lego Car Blog, but when we do they’re good. As demonstrated here by William Dumond‘s beautifully recreated Town-scale Bangor & Aroostook BAR X127 wrecker. Clever building techniques are in evidence throughout the build, and it functions too. See more on Flickr via the link above. Nick Barrett’s got a big one. It might not look it here, but this 15-wide Liebherr LTM 1130 mobile crane can grow to almost six feet tall! A four part extending boom is the key to such impressive length, utilising reels of string and a full-length ratchet mechanism (no linear actuators here). The entire superstructure can turn too, allowing the boom to slew left and right whilst the control cab can tilt to enable the driver to look along his huge appendage. Working suspension on all five axles provides a smooth ride, and helps to keep the boom up when the going gets rough, a V8 piston engine is turned via axle 4, whilst steering on axles 1, 2 and 5 allows the crane to get into tighter positions. That’s quite a list, as Nick’s build is packed with playable features, and you can see more – including photos of the Liebherr in its fully-extended glory – at his MOCpage. Click the link to get it up!